Farmers in the Canberra region have welcomed the latest forecast for a return to average rainfall during winter. 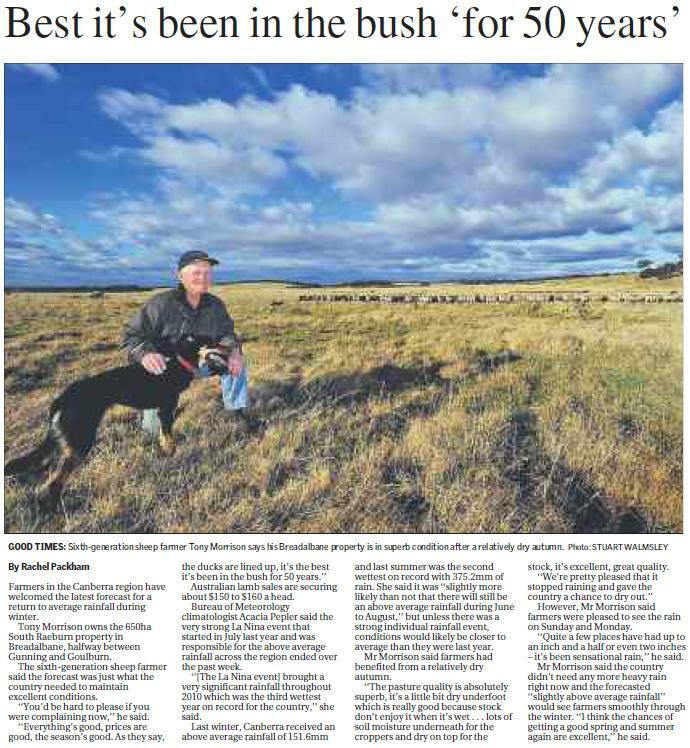 Tony Morrison owns the 650ha South Raeburn property in Breadalbane, halfway between Gunning and Goulburn. The sixth-generation sheep farmer said the forecast was just what the country needed to maintain excellent conditions. ”You’d be hard to please if you were complaining now,” he said. Australian lamb sales are securing about $150 to $160 a head. Bureau of Meteorology climatologist Acacia Pepler said the very strong La Nina event that started in July last year and was responsible for the above average rainfall across the region ended over the past week. ”[The La Nina event] brought a very significant rainfall throughout 2010 which was the third wettest year on record for the country,” she said. Last winter, Canberra received an above average rainfall of 151.6mm and last summer was the second wettest on record with 375.2mm of rain. She said it was ”slightly more likely than not that there will still be an above average rainfall during June to August,” but unless there was a strong individual rainfall event, conditions would likely be closer to average than they were last year. Mr Morrison said farmers had benefited from a relatively dry autumn. ”The pasture quality is absolutely superb, it’s a little bit dry underfoot which is really good because stock don’t enjoy it when it’s wet … lots of soil moisture underneath for the croppers and dry on top for the stock, it’s excellent, great quality. However, Mr Morrison said farmers were pleased to see the rain on Sunday and Monday. ”Quite a few places have had up to an inch and a half or even two inches it’s been sensational rain,” he said. Mr Morrison said the country didn’t need any more heavy rain right now and the forecasted ”slightly above average rainfall” would see farmers smoothly through the winter. ”I think the chances of getting a good spring and summer again are excellent,” he said.